Enjoying the pristine and rich sound of a turntable has become, yet again, preferable to the alternatives in recent years. Record players, also known as turntables, use a needle and vinyl record to produce a clear, one-of-a-kind sound. While there are many arguments about the better and unique sound of the turntable, the price tag can be off-putting. The wide range of features and settings on turntables allows for unique customization and can be very successful in both professional settings and personal settings. Many components come together to produce the crisp and rich music distinctive to turntables. The plinth is the base of the unit and makes sure that vibrations don’t disrupt the stylus. Other pieces that help with anti-resonance are the counterweights and anti-skate weights. The platter rotates in order to produce the sound while the stylus, also known as the needle, follows the grooves in the vinyl to produce music. These delicate grooves on the vinyl guide the needle through the music recording. This is a direct drive professional turntable with USB and analogue capabilities. Choose from 3 speeds and high torque for easy startup and high quality sound. This has a smaller frame but is still a fully automatic belt-drive stereo turntable. You’d love the die-cast aluminum base and stylus which is designed for easy replacement. This is a direct drive turntable with an S-shaped tone arm. It has a vintage yet classy appearance and prides itself on its lasting durability. This is an analog turntable with built-in phono pre-amplifier & USB digital output capabilities. Fans love its rich sound and high quality design. This is a direct drive DJ turntable with 300 cartridge and professional features and settings. If you want a turntable from a reputable company, Stanton has been around for over 50 years and releases high quality top products. Direct drive is of very high quality meaning reliability. This manual turntable provides features to customize your listening while also utilizing a high-quality sound. As well as quality and professional sound, the aluminum base plate, and DC direct drive motor mean that the Audio-Technica can withstand a lot of use. This turntable includes the ability to connect via USB to any PC for connecting to the Audacity application or software. It offers 3 speeds and high torque for fast and reliable startup. The 3-speed playback, forward, and backward playing features mean that you can customize music to your own taste. Professionally admired, Audio-Technica turntables have been around for over 50 years and have innovated record listening ever since their establishment in 1962. This is a fully automatic machine with a belt drive. The clear and high-quality sound from this turntable is due to the automatic belt drive design. This turntable combines easy operation with the automatic stylus’s moving function, as well as its ability to connect to larger speaker systems. This means that the crisp, rich sound is easily achievable. Not only is the sound of a great quality, but the die-cast aluminum base and easily replaceable stylus means that your machine will stay in good shape, even after wear and tear. This is a perfect turntable for newcomers as it has fewer feature for customization than its counterparts. But it still packs a punch with the quality. This is a direct drive turntable with 2 speeds. It is a manual turntable with full access to start and stop functions. It has a sleek die-cast aluminum platter that provides a modern twist on the original vintage design, but with lasting quality. The manual tone arm means that you have more control over your listening. With great sound quality and simple features, this turntable brings a vintage turntable into the modern day. 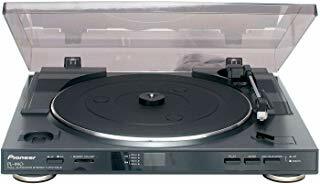 This is a manual belt drive turntable with USB output capabilities. A built-in phono pre-amplifier provides the option of plugging the turntable into a stereo system for increased volume. Transferring vinyl music to your Mac and PC is also easy because of the USB output capability. This reliable turntable is easy to set up and get started, and the motor gets up to speed within seconds. The rich sound of the turntable is due to the high-quality materials of the aluminum base plate and the Audio-Technica phono cartridge. These things provide a reliable reading. The anti-resonance capabilities are fully secure due to the heavy base and rubber platter. Once more, the high-torque DC motor makes for secure rotations and clear sound. This turntable has 2-speed playback and several start and stop settings to customize playback. It is easy to operate and perfect for DJs as well as any level of experience. Including several pitch, tone, and speed settings, this turntable has the ability to morph to fit any and all needs. This audio company is over 50 years old and has helped shape the way for future audio devices. First, decide between a belt drive and direct drive. This is a tricky one because it depends on preference and the machine, as to whether one is more reliable than another. The main difference is the location of the motor. A belt drive utilizes a belt mechanism to move the motor whereas the direct drive is an immediate connection. Therefore, it has a more immediate startup speed according to some users. Another thing to consider is the rotation speed. There are a variety of speeds available, and many turntables can adjust to several different speeds as well as distinguishing between playing forward or backwards. One more aspect of speed is the time that the turntable takes to get up to speed. Automatic versus manual is a hard decision to make for some. Automatic can be nice when the tone arm places the stylus on the turntable for you, but some prefer to do that themselves. While an automatic completes all the functions of a turntable with just the press of a button, the user must do everything themselves with a manual. USB and Bluetooth connectivity functions are becoming more and more desirable as they allow for outside connections to both speakers and PC software for professional and/or personal use. Some turntables have built-in speakers or options to change functions for such a desire. Moving magnet cartridges, also known as phono cartridges, help prevent damage to the delicate record groove. This prevents wear and tear to the records, so the life of the entire unit lasts longer. At the same time, they optimize response time which enhances the sound. Cartridges are small devices that can change the stylus pressure. They attach either on to the turntable or to the arm of the needle and help produce a clear, rich sound while maintaining consistency. Most turntables come with a cover of some sort to make sure dust and fluff from the air don’t mess up the systems. Some, however, do not come with one or have a cloth cover instead of sturdy plastic. If pets live in the house or storing your turntable is an issue, going with a secure cover might be a good way to go. Again, starting with the base and evaluating each piece of a turntable, it’s important to identify things to look out for. The material quality, as well as construction quality, have a lot to do with the stamina and lifetime of a turntable. Another important job of the base is to absorb and/or deflect any vibrations caused by the rotations of the platter. 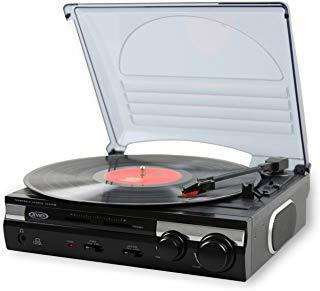 The reason for this is so that the minor vibrations and any knocks to the turntable don't affect the sound production or quality. Now to move onto the next most important piece, the platter. Like the base, the platter helps absorb some shocks and vibrations. Having a heavier material or heavier platter can be a more effective way of absorbing those imminent vibrations. Movements within the same space as the turntable can cause jumps and skips in the record, so having a heavy platter and base makes it less frequent. Other components such as the stylus, arm, and cartridges can be swapped around and customized in most midrange turntables. This makes it easy to play around with preferences to meet certain expectations; however, there are certainly a lot of opinions on which brands last the longest. Appearance can be a big part of the decision-making process, and with so many styles, brands and materials, the challenge becomes even harder. There is everything from a classy modern look to a vintage look available in today’s market. Speaking of appearance and materials used for production, there are some turntables out there that are eco-conscious. Meaning that they are made from recycled or reused materials. And in their production process, they are cautious of the amount of fuels used and emitted. For those wanting to save the planet or at least contribute less pollution to the planet, this might be a good option to look into. Now, you’re probably wondering what makes a turntable worth the price. Sound quality and richness are usually at the top of the list for many turntable customers. Making sure that a turntable has the unique, clear, and high-fidelity audio is a number one priority of both customers and production companies. Potentially the next most important aspect of a turntable is that they are durable and can last with repeated use. Use of heavier materials is preferable for turntables anyway, as they help absorb disruptive vibrations. But, at the same time, the heavier materials can boost the lifespan. Next comes the needle, tone arm, and cartridges. These need to be good quality if they are going to last, so finding a brand that has a reputation for creating well-constructed materials is important. In the same footing as talking about good construction and good quality materials, a midrange turntable should clearly show significant attention to this area. Solid materials and secure construction have a huge impact on the audio as well as the lifetime of a turntable. Another reason for going with a mid-range turntable is the ability to tweak what’s already there. A lot of turntables in this range have the ability to swap out one cartridge for another based on your preferences or change the stylus to better fit your needs. At mid-range, there likely isn't any more improvement waiting for the audio side of quality, so anything more expensive just adds customization options. To get the most out of your money when choosing a turntable, it’s important to keep in mind your wants for your new device. There are so many options, so having the knowledge about what you are getting into can help you navigate this complex market. The turntable market has become, yet again, a preferable and popular way to enjoy music, with many brands specializing in certain parts. The rich, pristine sound of the old turntable has become popular. Now, though, it has a new, modern twist. Sound clarity and richness, as well as quality construction seem to be the two most important components to keep a turntable successfully working for a long lifetime.